Dallas can't be preceded by an automatic obscenity at Lincoln Financial Field anymore. In fact, it may someday become a revered word at the stadium – at least when the Cowboys aren't in town. 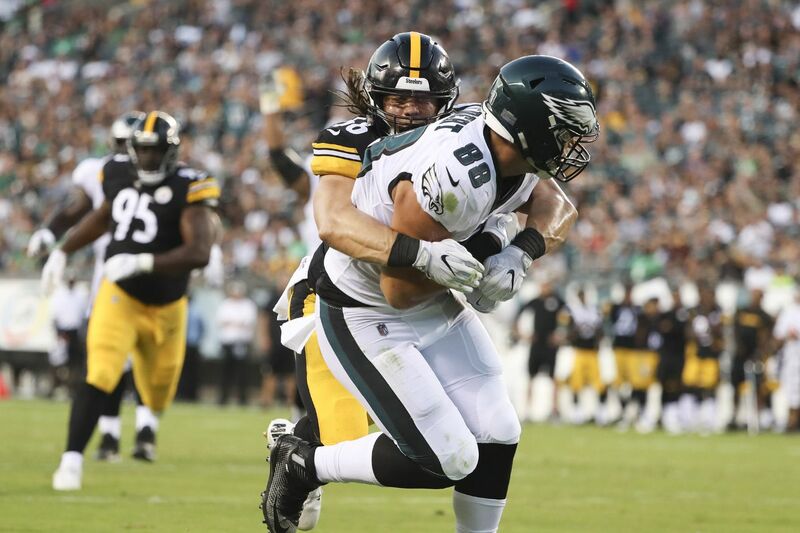 The new Dallas in Philadelphia made his debut with the Eagles on Thursday night, and without overstating the importance of the preseason, Dallas Goedert's first NFL game was a success. The rookie tight end caught four passes for 66 yards and a touchdown in a 31-14 loss to the Steelers, and he handled his blocking duties successfully despite concerns about that skill set. Goedert has room for improvement – he dropped a pass and whiffed on a block – but the Eagles couldn't have asked for a better unveiling from their second-round draft pick. "I thought I did pretty well," Goedert said. "There's definitely things I need to improve on, but that's to be expected with the first game." Goedert got the start, with Zach Ertz getting the night off. The Pro Bowl tight end missed several practices in the last week with an unspecified injury, returning on Tuesday. But he was limited, and there was little reason to place him in harm's way two days later. Ertz's absence meant that Goedert was on the field for nearly every offensive snap of the first half. He would have played a lot even if the regular starter was healthy – the Eagles love their two-tight-end sets – but Goedert took Ertz's role and was heavily featured. From a distance, they look alike. Reporters have had difficulty distinguishing who is who during training camp, partly because Ertz's "86" looks a lot like Goedert's "88," but also because of their similar size and route running. That's an early compliment for the rookie. Goedert is a little bigger – he's listed as six pounds heavier – and he's a little more physical, but his pass-catching has been just as smooth as Ertz's when he was in his first camp five years ago. His performance against the Steelers was just an extension of his receiving in practice. "I wanted to feature him a little bit," Eagles coach Doug Pederson said. On the Eagles' second drive, Goedert ran an out route beyond the linebackers in the soft spot of a zone, and quarterback Nate Sudfeld hit him 26 yards downfield, before he ran out of bounds. It was the first pass thrown his way. Two series later, Goedert ran a seam route, again against a zone, but the Steelers failed to pick him up, and Sudfeld hit him in stride for 19 yards. Five plays later, Sudfeld avoided an unblocked blitzer off the edge, moved to his right, and connected with an open Goedert for a 15-yard touchdown. Sudfeld's improvisation made the play, but Goedert instinctively found space as his quarterback scrambled. "I just kind of ran my route, and when I looked back I saw Nate step up and scramble to my side," Goedert said. "So I kind of shifted to a spot where I thought I was open, and he was able to hit me." He later added a 6-yard grab. There was a bungled pass, though. Goedert ran a crosser, and the ball bounced in and out of his hands. Catching the ball has hardly been an issue in camp. If there was a quibble — and he couldn't have done anything about it — it was that none of his receptions came against man defense. Goedert's blocking was the biggest question mark coming into the game. He wasn't asked to do it much at South Dakota State. Eagles tight ends coach Justin Peele has drilled Goedert since May, and there have been a few blocking periods in camp, but this was his first real test. "He's a willing participant to block," Pederson said. "He's just got to continue to trust his technique, trust the coaching, the way Justin is teaching. He needs to continue to just get stronger. It's good to see him stick his face in there and be physical with defensive ends, outside linebackers." On the first play of the second possession, Goedert kicked out cornerback Artie Burns as running back Jay Ajayi motored through a hole off tackle for 22 yards. The tight end should always win those battles. He faced a bigger challenge a couple of plays later, during a split-zone run. Goedert's job was to block the linebacker on the backside, and he took out Jon Bostic as Corey Clement rushed up the middle for 5 yards. Goedert's assignment a run later was 305-pound nose tackle Javon Hargrave. He stood his ground, despite giving up 50 pounds, and Clement picked up the first down with a 6-yard burst. The drive stalled, however, when Goedert missed his block on linebacker Farrington Huguenin, and Ajayi was dropped in the backfield for a 4-yard loss. He fared better against Huguenin on the Eagles' next drive, driving him on back-to-back Clement carries for 7 and 9 yards. Goedert cut-blocked linebacker Anthony Chickillo at the thighs as Clement moved the sticks again. And his best moment might have come when he sandwiched L.T. Walton to the ground after the defensive tackle penetrated the backfield. "I never really whammed the three-techs," Goedert said of blocking defensive tackles. "But we have it in this offense, and it's something I'm willing to do, able to do." Wendell Smallwood gained 13 yards on the carry, and, two plays later, Sudfeld hooked up with receiver Shelton Gibson for a 63-yard touchdown. Goedert played some special teams in the second half, but his night on offense was over after the break, as third-stringer Richard Rodgers, Billy Brown, and Joshua Perkins took most of the repetitions at tight end. Overall, it was a strong showing. For the sake of comparison, Ertz caught two passes for 10 yards in his first preseason game. Goedert might not get as many opportunities his next time out. But there's little doubt he'll be a featured part of the Eagles' offense alongside Ertz.